An important aspect of cycling is that different terrain suits different riders. That’s why I always like to see the Grand Tour contenders beaten on an incline. It reinforces the notion that the sport’s a little more nuanced than just ‘fastest uphill’. Philippe Gilbert is fastest uphill, but only for a bit. Give him a short slope and he’ll beast away from you. Extend it and he’ll fade, return to the pack and then go out the back. Fortunately for Phil, stage 12 finished with a short, nasty slope – 1km at 7%, steepening as it went – exactly the kind of thing he enjoys. Cyclists invariably talk about ‘going into the red’ as being a bad thing. It describes a level of effort that’s unsustainable for any great length of time that brings a physical cost later on. Gilbert’s thing is basically going into the red. Behind Gilbert, things happened. Alberto Contador finished second, snatching a time bonus (time bonuses are always snatched, never earned) while Fabio Aru lost a few seconds on top of that through not riding quickly enough. Contador’s group of riders finished three seconds behind Gilbert. Richie Porte and Rigoberto Uran were in a group that finished six seconds back and then Aru’s group were 11 seconds back. Minuscule time gaps in the grand scheme of things, but perhaps indicative of something more. Aru stays second overall, but is he on the slide? 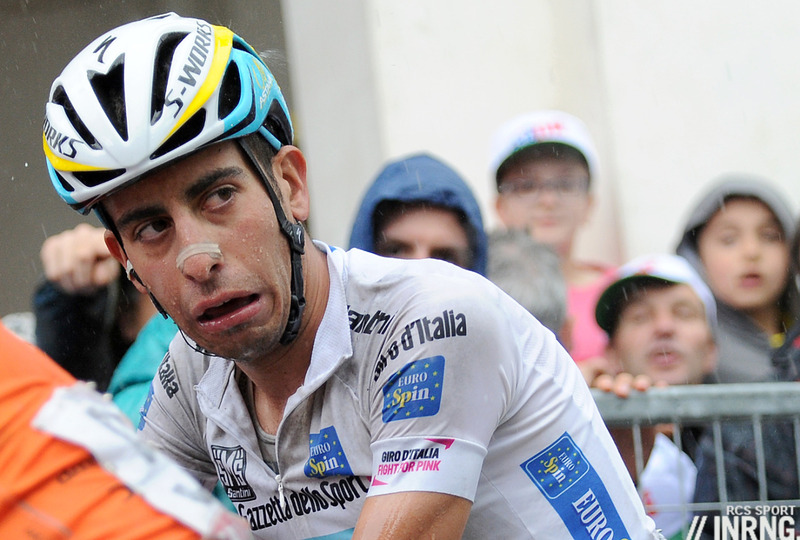 For a week he’s been attacking Contador whenever he could. The last couple of days, he seems to have faded a bit. This is what he looked like at the end of the stage. There’s some talk that Aru hates rainy weather; that he’s so scrawny, the cold affects him more than most. This may well be true, but is it the full story? It was also a tough day in terms of racing (as it always seems to be in this year’s race). There were some proper slopes above 15% and this, combined with hairy wet descents that saw worrying numbers of riders falling, meant that the peloton was sliced and diced before the finish and it wasn’t always clear that it would reassemble itself. Bad weather and tough racing certainly seemed to see Aru struggling, but how would he have gone on the same stage on a dry day? We have no way of knowing, but we’ll get some idea as the race wears on. Here’s a link to the overall standings because I can’t be arsed writing it all out today. Flatter than an ironed pancake.